I came back to the office and was completely overjoyed to read the email below. 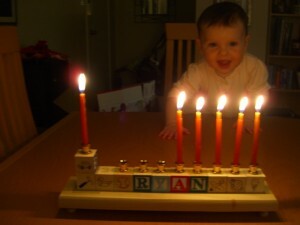 When my friend Kristy had her baby Ryan, I bought her a personalized menorah (a gift that my Jewish friend Lizzie recommended). 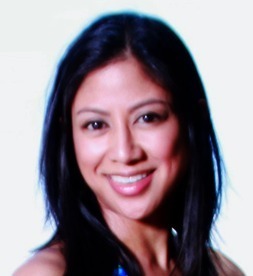 I have mounds of respect for Kristy because she went out and researched religions, determined that Judaism was right for her, and has fully settled into her faith. As I’ve mentioned before, I feel that people who “get religion” when they’re adults, are so much more educated in faith than the rest of us. Kristy took the time to write out a comprehensive email prepping me before the first bris I attended. I laughed when Dean started explaining some of the traditions to others at the bris. Look at how cute Ryan is. I treasure this picture. I hope you are still having a wonderful time! This picture will make it to my blog once Hannukah is over but I didn’t want to wait until then for you to see it. I’ve been lighting Ryan’s menorah every night we’ve been home. Tonight I took pictures. BTW, before and then again after Hannukah, I keep her menorah on a cute little display shelf in her room with special hand-made stuffed animals made by relatives and sweet pictures. It was a lovely lovely gift.